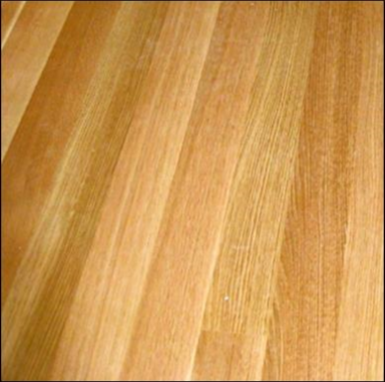 Plain Sawn, also commonly called flat sawn, is the most common sawing method you will find. The character markings and figure patterns resulting from the annual rings are brought out more fully in this cut. 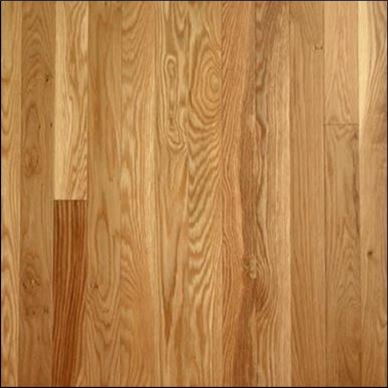 The grain characteristic is a cathedral graining that is prominent in woods like Oak. This cut produces the maximum yield and therefore costs less than the other cuts. 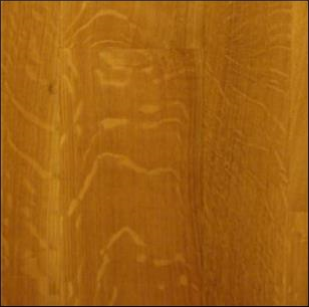 Rift sawn grain is very straight and runs vertical on the face of the board, this cut produces lumber of the greatest stability and wear. This type of sawing is a technique of cutting boards from logs vertically so the annual rings are nearly 90 degrees to the face. However, since this produces a great deal of waste rift sawing is much less commonly used than flat and quarter sawing.  Rift & Quartered flooring is highly valued for its unique texture and color combination that brings together vertical and radial grain which offers strength and durability. 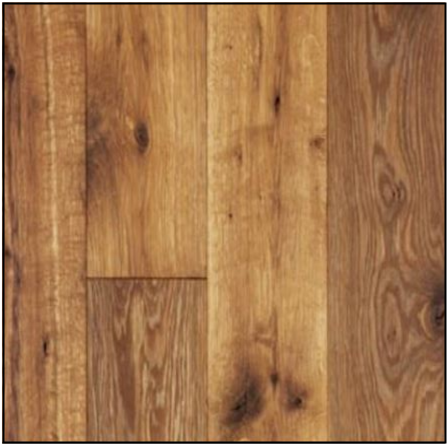 A Quarter sawn cut splits the medullary ray of the wood, causing a beautiful plumed or flared appearance referred to as “rays” or “fleck”, often appearing shiny or reflective. 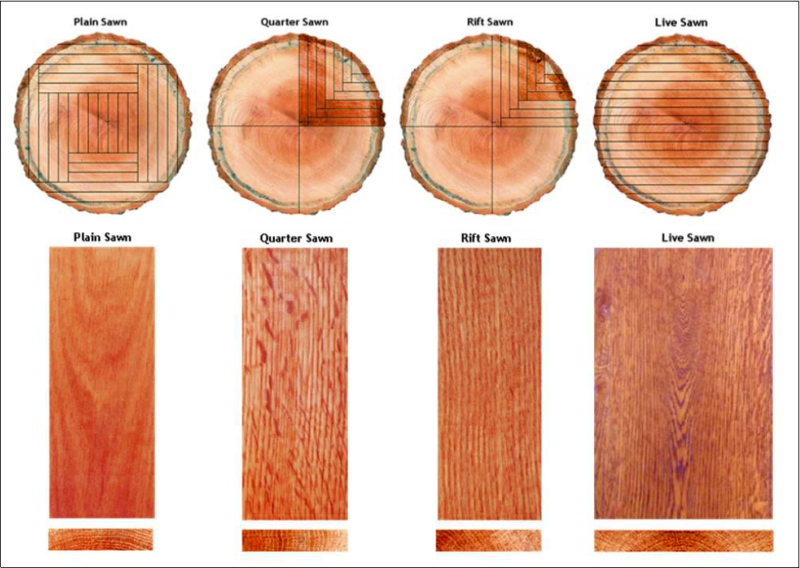 The medullary rays are not present in every wood species - most common are red oak and white oak. All of the boards are cut of radial grain, with growth rings positioned at between 60 and 90 degree angles to the face of the board. 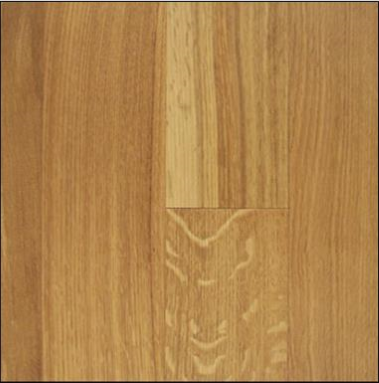 A very popular cut for white oak. It produces much wider boards than other methods. 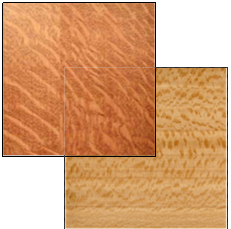 The grain pattern is mostly mixed grain with the cathedral flat grain in the center of the face and vertical quarter grain near the edges. Medullary rays radiate out from the pith, and run like ribbons perpendicular to the grain. When quarter sawn, these rays are exposed, and while all trees have medullary rays, only certain species will display them in obvious fashion. The exposed medullary rays produce a kind of figure in the wood, and are commonly called “ray fleck”.